There are some things a journalism degree doesn't prepare you for, but joining a raid certainly tops the list. I should be gripped by anticipation, yet my mind is preoccupied by Sergeant Amos Durose ushering me into the back of the police car. A force of habit perhaps, but no less intimidating when he's armed with a gun and wearing a bullet-proof vest. I am now sitting where many criminals have before me as we depart Kidsgrove police station and head off to join a swarm of Staffordshire Trading Standards officers gathering outside a quaint little bungalow. 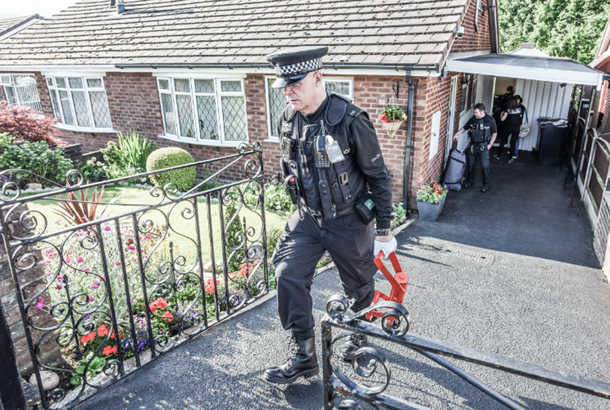 Waiting for us is senior investigator Nigel Cotton, who is busily assigning roles while a gaggle of residents peer through half-opened curtains. 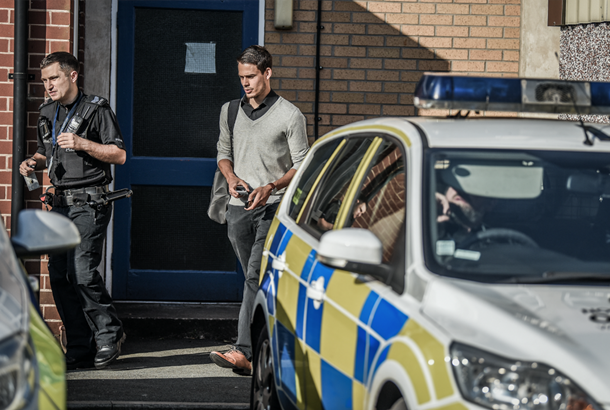 Search warrant in hand, Cotton stands aside while Durose and another policeman hop between flowerbeds to peer through the windows like a pair of over eager estate agents. Suitably impressed, Cotton starts thumping the front door as Durose scales the garden fence with all the grace of a Ninja Warrior contestant. Unable to gain entry, the other policeman storms off and reappears carrying a battering ram. The thought of seeing a door fly off its hinges has suddenly got my attention, including the homeowner's who appears just in time to avoid a hefty repair bill. The next two minutes pass by without incident as Cotton sifts through paperwork and the policemen inspect every room, one by one. "Have they got the wrong address?" asks one nosey neighbour. The suspect's sheepishness suggests otherwise, and it isn't long before his crimes are laid bare. Wearing a FootJoy top and a Titleist cap lowered over his eyes, he reluctantly opens his garage door to reveal his stockroom. 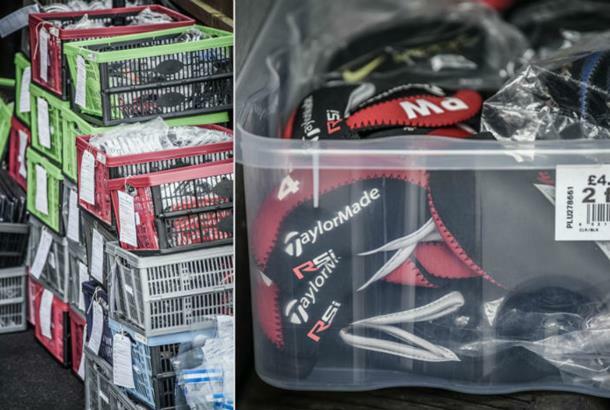 There are more than 40 crates piled high, full of everything from Under Armour belts and TaylorMade hats to Callaway headcovers and SuperStroke grips. Or so it seems. They are all imitations with an estimated retail value of £35,000. Across town, another house is being raided simultaneously, but Cotton reckons they've already found most of the stock here. "It's a good haul," he says, pausing briefly to organise a van to take everything away. – more than 4,000 of which were set up using identities stolen from other customers. ・Action Fraud received over 15,000 reports linked to identity crime last year. "He wasn't expecting us – he was still in his dressing gown. He has a purpose-built room full of contents, and we've found paperwork and parcels waiting to go out. 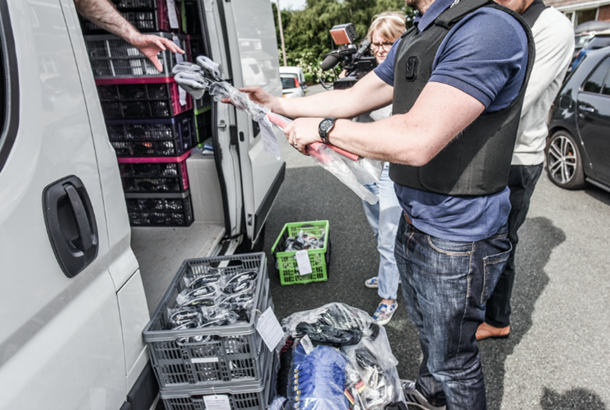 Our intention is not to arrest anybody today, but the items will be seized and forensically examined. After that, we'll contact the brands involved, take statements and then we'll call the individuals in for a formal interview." It's an anticlimax to what has gone before, but no less satisfying for Tony Fletcher, UK sales director of Brand Fusion, who first alerted the authorities to the counterfeit operation. "It's rewarding because we need to name and shame these people," he says. "They see counterfeiting as an easy way to make money, but it does massive damage to the brands, industry and people's livelihoods." Sadly, it's an issue which isn't going away; and ended up costing the UK economy £17.3 billion, according to the Centre for Economic and Business Research. Designer handbags and shoes have long been easy targets for fraudsters, but golf accessories and equipment are now engulfed by the same issue. A search on eBay reveals that dozens of sellers are currently advertising the latest gear at a fraction of the retail price. The difficulty, though, comes in trying to discover their identity. "The internet has facilitated people's ability to buy and sell counterfeit goods with a degree of anonymity," claims Fletcher. "You never see the person you buy from, and a lot of the time they work out of a PO Box and don't provide any contact details. eBay has a VeRO programme, which gives brand holders the opportunity to report people for selling what they suspect to be counterfeit goods. But all eBay does is shut down that listing; it doesn't stop that person from putting up another one." Fletcher's exasperation stems from how many perpetrators end up going undetected. "If someone was selling a fake Epic driver, they would get found out because people would be able to tell and want their money back," he adds. "But a set of golf grips can go completely under the radar because they only cost £15. To catch the offenders in the act, Fletcher has resorted to carrying out test purchases. "Because Brand Fusion is a distributor of SuperStroke grips, part of my role is looking online at different sellers and checking their legitimacy," he continues. "I have a grip which we bought from SuperStroke's factory in Taiwan and I use that whenever I have any doubts about a grip being a counterfeit product. In this case," he says, pointing to the now empty garage, "the gentleman was selling a number of grips on eBay at a price which seemed far too cheap. "That aroused my suspicions and I then found other golf branded products which I didn't recognise. It was quite a complex operation, involving 10 to 12 other companies, and through that Trading Standards were contacted." Martin Wild, sales director for Callaway UK and Scandinavia, was one of those consulted and he reveals that the suspect had been selling Callaway iron covers the brand doesn't even make. "Talk about putting a red flag up," bellows Wild. "He has probably already made thousands and robbed genuinely good retailers of income." Fletcher admits he's currently watching at least 60 sellers on eBay whom he suspects are trading fraudulent goods. "I always work on the principle that if it's too cheap, it's either stolen or counterfeit," he says. 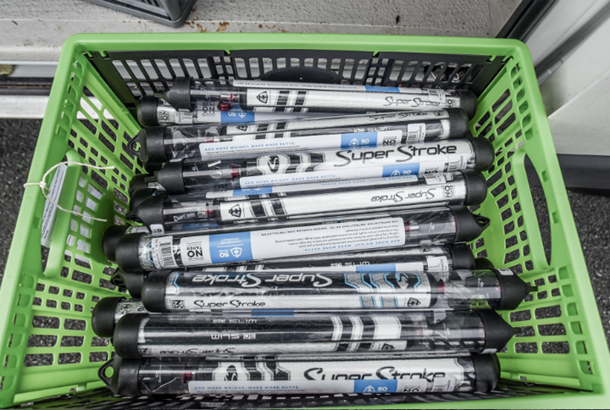 "SuperStroke grips retail between £20 to £30 and yet one guy was offering them at £4." "It's ridiculous really because we end up spending thousands of pounds in legal fees. From the point of buying a grip to see whether it is counterfeit to actually going to trial, it can take between nine months to a year. It's a long, drawn out process, but we've had two successful prosecutions with people selling counterfeit SuperStroke grips. Fingers crossed this will be our third." What happens now is out of his control, but Durose is quick to point out that justice always prevails. "These people will get caught, either by ourselves or Trading Standards," he says. Today is proof of that, even if it means I'm the one being led away in the police car once again. ➤ Alway trust your instincts; if an offer looks too good to be true, then it most probably is. Check the spelling and grammar on the website and of the URL. Fraudsters behind these sites will try to deceive you by slightly changing the spelling of a well-known brand in the website address. ➤ Look to see where the trader is based and whether they provide a postal address – just because the web address has 'uk' in it, do not assume the seller is based in the UK. If there is no address supplied or there is just a PO box or email, be wary. ➤ Only deal with reputable sellers and only use sites you know or ones that have been recommended to you. If you have not bought from the seller before, do your research and check online reviews. People will often turn to forums and blogs to warn others of fake sites. ➤ Keep security software and firewalls up to date. ➤ Ask the trader if there is a returns policy or guarantee. Most rogue traders will not offer this. ➤ Watch out for pop-ups asking you to confirm your card details before you are on the payment stage. Never enter your PIN online. ➤ Ensure the website address begins 'https' at the payment stage – this indicates a secure payment. Tony Fletcher, UK sales director, Brand Fusion, says: "If you buy a golf product off eBay and you suspect it to be counterfeit, go to your local golf professional who should be able to tell you. If you are still in doubt, contact the manufacturer and they can verify whether it is a legitimate product or not."